What are online charity auctions? Online auctions are essentially digital silent auctions. To run one, nonprofits must first put up an online auction site, which lists out descriptions and photos of items and enables supporters to bid. Participants must first register by inputting their credit card information. Why host an online charity auction? Online auctions can help nonprofits raise a lot of money. After all, the chance to walk away with an amazing prize spurs more giving! Plus, since they’re completely digital, online auctions are more cost-effective to plan and can be opened up to more supporters, increasing fundraising potential even more! How Do Online Auctions for Nonprofits Work? 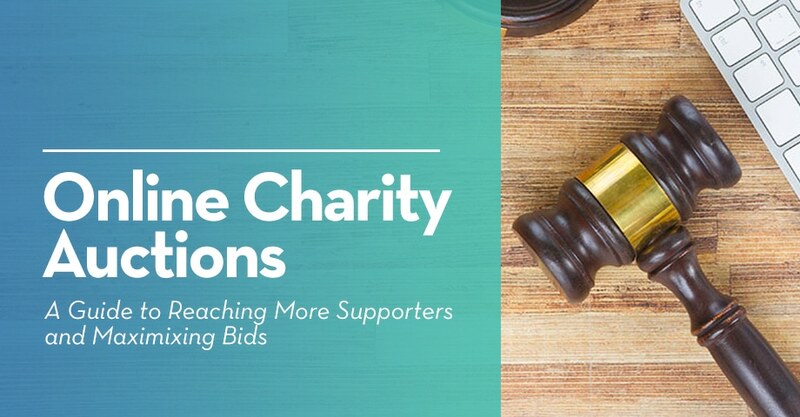 Should Your Organization Host an Online Charity Auction? Why Use Online Charity Auction Software? To host an online auction, you’ll need to set up a digital venue! To do so, you’ll need to use auction software to generate and populate an online event site that supports bidding capabilities. To participate in your online auction, bidders must first register on your online event site by submitting their name and payment information. Don’t forget to share the link a few weeks in advance! Once the start date of the auction rolls around, your organization will open bidding. Participants will generally have 1-3 weeks to place their bids, but it can vary based on your organization’s needs. Each item is set at a starting bid amount around 30-50% of that item’s market value. This starting bid amount dictates the minimum amount that the first bidder can pay to start off the bidding on that item. Each succeeding bidder must top the previous bid by the minimum raise amount to become the new highest bidder. The minimum raise should be set between 10-15% of the item’s market value. The auction site will automatically close down bidding on the set end date and determine winning bidders. Whoever has placed the highest bid at the time the item closes is that item’s winner. By submitting their payment information before the online auction started, the winner has agreed to pay the amount they bid for that item. Credit cards are automatically and instantly processed through the site. It’s the organization’s responsibility to ship the item to the buyer in a timely manner. Otherwise, The buyer assumes full risk and responsibility for the item. Make sure to package items securely for your donors. More cost-effective. With online auctions, you won’t be throwing a physical event. Since you won’t have to rent out a space, provide dining options, etc., you can cut event expenses significantly. Lots of flexibility. Online auctions are the most flexible. An online event can run for much longer than a physical one, and people can participate at any time, from anywhere. Seamless data collection. To host an online auction, your organization will set up an auction site through your event planning software. 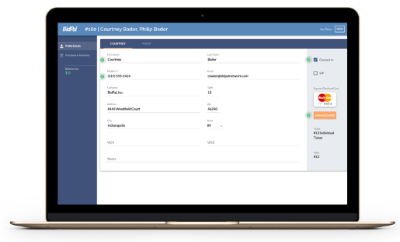 The software links up to your nonprofit CRM, making donor and payment data collection seamless. No personal touch. Since the event will be happening in cyberspace, online auctions lack a personal touch. 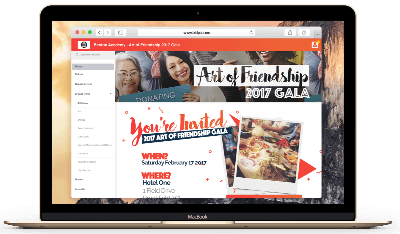 If you’re hosting the event as a chance to get to know your donors better, an online auction is probably not the way to go. Fewer incentives. Because there’s no aspect of friendly competition or urgency with an online auction (most usually last 1-3 weeks), there are fewer incentives for people to bid. Not a central focus. Online auctions run for a longer period of time and are less tangible to donors. Because it’s not a grand affair but something participants will do when they have time to spare, your auction can easily become an afterthought. 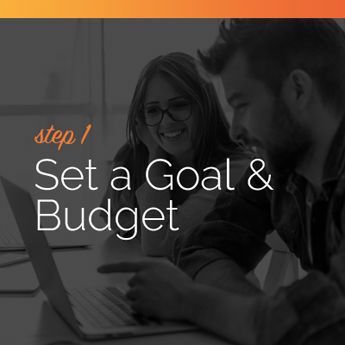 Start planning your online auction by setting a budget. Online auctions require fewer expenses than in-person auctions, so your organization can get away with a more limited budget. However, oftentimes online auctions are paired with live or silent auctions. If you’re hosting a combination auction, you should factor in the costs of both events. Additionally, decide on a goal. Knowing what you’re aiming for will help you ensure your auction is profitable. You might also choose to conduct your online auction as part of a broader campaign, like a peer-to-peer fundraising campaign. Carefully plan how all the parts will fit together. To pull off an online auction, you’ll need a dedicated team to oversee the effort. Luckily, since online auctions require fewer logistics than an in-person event would, your team can be much smaller. 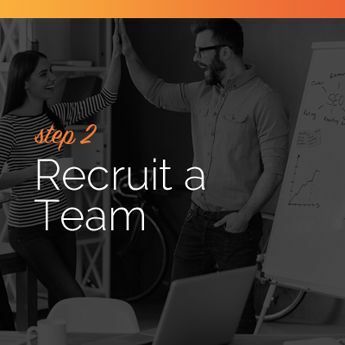 To get a team together, think about all of the efforts needed to plan and execute your auction. Then, determine which staff members and volunteers have the time and skill set to manage these efforts. 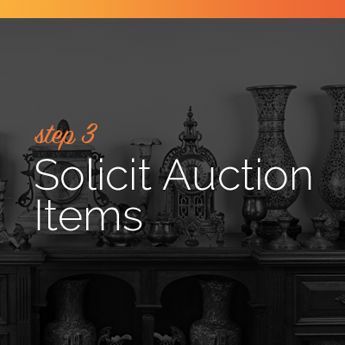 Have your solicitation team start seeking out the items you’ll be auctioning off. The best items for an online auction will appeal to people in all geographic locations. Additionally, the most desirable items will be those that offer bidders something that they couldn’t find anywhere else, like a baseball signed by a famous player or the chance to go backstage at a concert. Remember not to procure anything too large or heavy, or else your items might be too cumbersome to ship to the winners. Learn More About the Procurement Process. Your auction software will be the venue for your online event, so choose wisely! Once you’ve picked an auction software platform, you can start building your auction site. Since bidders can’t view items in person, it’s very important to include high-quality photos and a detailed description of each item and any restrictions (such as blackout dates), so participants know exactly what they’re bidding on. Another plus side of hosting an online auction is that anyone can participate! Your event won’t be limited by the size or location of the venue, so your guest list can be more extensive. 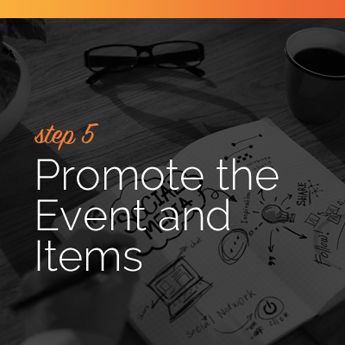 In the few months leading up to the event, start promoting both your items and the event. When people know about your event and can start getting hyped up about all of your amazing items, supporters are sure to join in and start bidding! Let supporters know you’re hosting an online auction. Give them the dates of your event and tell them about the goals you hope to achieve. Don’t forget to tell them how you plan to use the proceeds! Most of your supporters will never have used an online auction site before, so you’ll need to explain how to participate. For most platforms, bidders will have to register and input their credit card information before making a bid. Your online auction site will serve as your auction catalog. Share the link with supporters so they can register, browse items in advance, and start getting excited about your auction! Once the day of the auction rolls around, it’s time to open bidding. Most online auctions will last 1-3 weeks, giving participants plenty of time to place their bids. Make sure you have a staff member overseeing the bidding to answer any questions supporters have and to field any possible technical difficulties. You should also be actively engaging supporters throughout the span of your auction by giving them updates on high value items and sending out reminders about when the auction will close. The clock is ticking, and the time limit you set for your online auction is almost up. 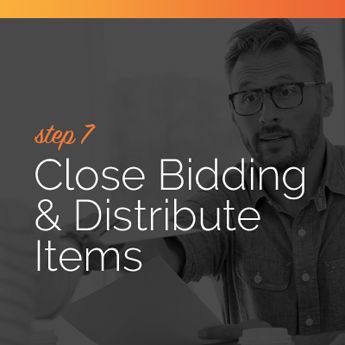 Luckily, you won’t have to worry about closing the bidding, because your auction software will automatically do it for you! Most platforms require bidders to enter their credit card numbers before the bidding to ensure that winners will follow through on their payments. Winners are charged automatically, so your organization doesn’t have to worry about payment processing. Properly package and ship out each item to the winner in a timely manner. You should also send out thank-you notes to acknowledge participants for their support. 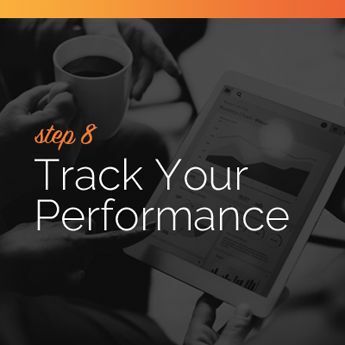 Evaluate the success of your auction by tracking your performance. Tracking your performance with your online auction should be pretty straightforward. 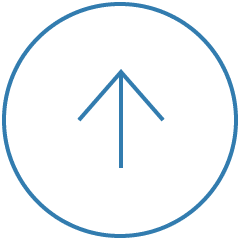 Since the auction is happening right in your event planning software, all item and bidder information will automatically be recorded in the platform for you to analyze now and in the future. How well did we do at reaching our goals? What can we change next time to make our auction more successful? While charity auction software can also help organizations streamline their in-person auctions, they’re absolutely crucial for online auctions. Auction software will enable your organization to build the event site, where supporters can view items and place their bids. Online auctions don’t require as many hands, but you’ll definitely still want a team dedicated to this effort. Your online auction committee will get the auction software platform set up, answer participants’ questions, and ensure that online bidding runs smoothly. When choosing online auction items, you’ll want to avoid large, heavy items that are difficult to ship and find items that appeal to supporters in all geographic locations. Additionally, when listing items, tell bidders whether shipping is included or if it’s an additional charge. One of the pitfalls of online auctions is that guests can’t view the items firsthand. Make your items as tangible and attractive to guests as possible by including high-quality photos of each item on your auction site. As obvious as it may seem, for people to bid on your items, they genuinely have to want them. Items that fit into your supporters’ interests will naturally appeal to your guests. It’s the basic law of supply and demand. The rarer an item is, the more valuable it is. When you offer objects or experiences that your guests can’t find anywhere else, they’re sure to bid in fear of missing out! Fall into guests’ price range. As much as somebody is dying to win an item, they simply won’t bid if they can’t afford to. In order to see fundraising success, your attendees must have the financial capacity to bid on the items you’re featuring. Enlist the help of auction software. Auction software will make it much easier and more efficient to set up and manage an online auction. Record item data. Make records for all of your items in the software platform by inputting all relevant item data. Generate and customize the site. Your software will automatically pull the item records you’ve created to populate item listings on the site. 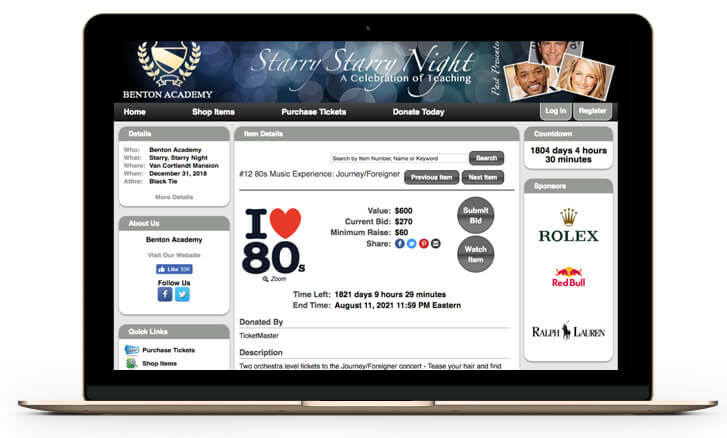 You can then easily customize the site to your organization’s brand and the needs of the event. Share the link. 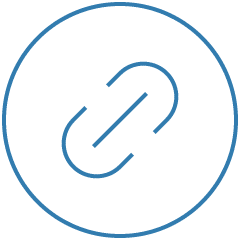 Share the link to your site before your auction opens. That way, supporters can register, browse items, and start getting excited! Open bidding. 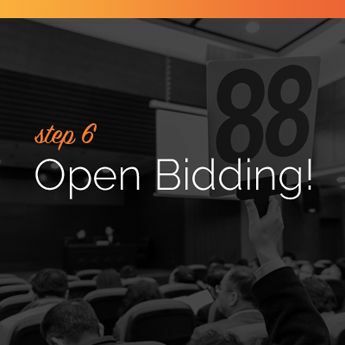 Set your software to open bidding on the day your online auction starts, then watch the bidding ensue! This auction site presents a great example of what to include in item listings. Notice how the organization has included all of the information supporters need to feel confident about placing their bids. Click on the image to see it in more detail! 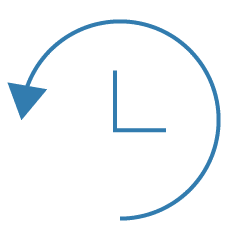 With auction software, your organization won’t have to spend time manually creating item listings on your auction site. Instead, the software automatically populates your site using the item data you already have on file. 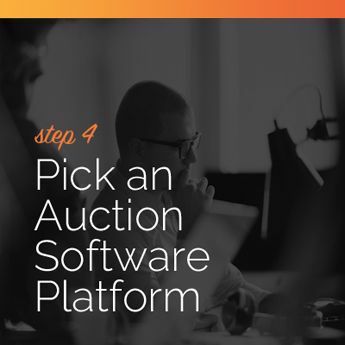 Without auction software, your organization would likely have to know code to make any changes to your auction site. 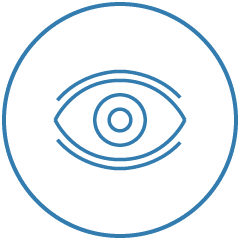 Software eliminates the need for coding, making it easy for you to create a site that perfectly reflects your nonprofit. Auction software centralizes all data sources tied to your event, making collecting and leveraging data much more manageable. With all data in the same place, you’ll receive a holistic picture of how all aspects of your auction come together. Auction software enables you to run a variety of reports, giving you deeper insights into your event performance than your organization could receive elsewhere. Keep improving to make your auction the best it can be! Learn more about Auction Software. Get inspired with 115 auction item ideas. Learn about planning a silent auction. Learn about planning a live auction.